This transaction was two-way, with nothing siphoned off for middlemen, distributors, or brick-and-mortar stores. The early full payment was a critical factor, enabling cash to the farmer when needed to buy seeds, hire staff, invest in improvements and equipment, and pay all the regular bills of any business. The customers of a CSA get produce straight from the farm, coming from a farmer they know and trust. It is a mutual relationship based on that knowledge and trust. Recently, however, a lot of new farm share marketing services have popped up claiming to be supportive of local agriculture. Some even claim to be CSAs. But many of these are based on the presence of a middleman who takes part of the price, leaving less for the farmer — precisely what traditional CSAs are designed to avoid. Many also promote their ‘convenience’ by having more items than any single farm is likely to raise (dairy, meat, fruit, bread, fish, eggs, mushrooms, honey) and also have items which are clearly not local (citrus, coffee, avocados, olives) and which provide no income to local farmers. 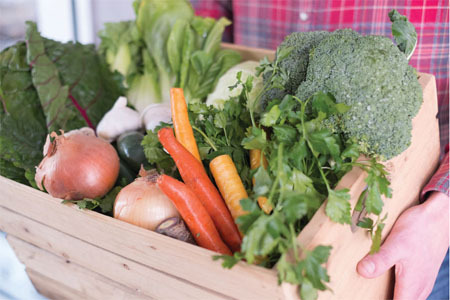 There is no question that many customers are attracted by convenience and a broader array of products than are likely to be sold in a one-farm CSA. But those are exactly the reasons most people buy at stores and most of the resultant money goes to non-farmers. Only one kind of arrangement – the CSA — pays the farmer 100% in advance, year after year. In addition, CSAs give the farmer control of the market. When selling to a middleman, however, the farmer is in competition with all other farmers. The dynamics of the market mean that the middleman is going to look for the lowest possible price. Even if that means a farmer has to sometimes sell for less than cost, given the perishable nature of produce, that may be what she is forced to do. Among the programs cited by Moskin exemplifying this lack of control by farmers are a farm-to-table subscription service called Local Roots NYC which has almost two dozen pick-up sites around New York City on Tuesdays, Wednesdays and Thursdays and buys from a Pennsylvania vegetable farm, a New Jersey fruit farm and a Pennsylvania mushroom farm, as well as two dairies and a cheese operation, three bakeries, two granola companies, a pasta maker, a fish wholesaler, and a honey producer. Only the vegetables are organic. A second operation cited was Rustic Roots, a home delivery service requiring customers to preorder by Saturday night for delivery on Tuesday through Thursday of the following week. Several share sizes range from $43 to $105 (with $50 of meat) and don’t include the flat $10 delivery fee or the cooler or insulated bag fee if you want those to keep your order cool for several hours. Suppliers include a couple of organic fruit and vegetable farms, an Amish co-op, five meat and poultry operations, an Alaskan fish company and a maple syrup supplier. As another example, Peapod is an online shopping service owned by the international grocery giant Ahold. The minimum order is $60 and the delivery fee starts at $2.95. Peapod delivers not only food (not local) but also health and beauty products, pet care, household products and paper goods. FreshDirect offers meal kits (priced at $10 to $12 per serving) as well as fruit, vegetables, meat and poultry, dairy, bakery products, frozen goods, beer, wine and spirits in New York, Vermont, Pennsylvania and New Jersey. According to Moskin these new programs are not really CSAs. That term is not regulated in most states and can be used pretty much by anyone for anything. But these new ‘aggregators’ or ‘food hubs’ are burdened, by their very nature, with different risks and concerns than CSAs. They do not represent important markets for a host farm, for example, and can come and go quickly if not meeting the needs of the founders. One, Good Eggs, ended deliveries in three cities – Los Angeles, New Orleans and Brooklyn – suddenly in 2015 after one year of operation. Farmstr, founded in Seattle in 2013, also shut down in 2015. The growth of demand for local and organic produce in the last few years has fueled a rash of new ideas for connecting farmers to customers. Online hubs that used sophisticated software to manage distribution was one approach, and many appropriated the acronym ‘CSA’ to describe their service. But some of these were transitory. In midsummer 2016 15,000 households that subscribed to a company called Farmigo received their last food boxes in New Jersey, New York, Seattle and Northern California. The three year old company had run through $25 million of venture capital raised on the strength of a food distribution software platform – an online farmers market of 700 items — that founder Benzi Ronen claimed would replace supermarkets. But the realities of managing all those items — washing, packing, refrigerating, distributing and delivering them to 400 locations — proved too difficult. So Farmigo members lost their shares and the farmers Farmigo had contracted with were left with fields full of produce they had planted for a buyer no longer interested in them. The siphoning of customers from real CSAs to these middleman-oriented aggregators or food hubs is of great concern to many small farmers. While the new businesses may still buy their produce, the farmers no longer have effective power in the relationship and may well have to forego some of their income, handing it to the middlemen. Many CSAs also report that after years of growth, their memberships have declined since the arrival of services like Local Roots or Farmigo. Judith Redmond, owner of California’s Full Belly Farm, which was once one of the oldest and biggest CSAs in the Golden State (the only state which has actually codified the term ‘Community-Supported Agriculture’), reports that her membership, after holding at 1200 members (and a long waiting list) since 1992, dropped significantly in 2016. “At first it seemed like these services were going to be great for us,” Moskin quotes Eve Kaplan-Walbrecht, an owner of Garden of Eve farm on the North Fork of Long Island, as saying. Some of these services supplied handy software programs and marketing tools; others picked up the produce at the farm rather than requiring delivery to a warehouse, yet others offered premium prices close to farmers’ market rates. But Ms. Kaplan-Walbrecht reported that her CSA membership had dropped from a high of 900 in 2012 to 600 now. “Do consumers even know that when they sign up for one of these fake CSAs, sometimes it doesn’t benefit local farmers any more than if they shop at the supermarket?” she asked. The real problem with these new markets, say farmers, is that they should not be called CSAs. Partly by offering a more convenient product the hubs have siphoned off the traditional farm CSA members. To make matters worse, the hubs blur the definition of terms like ‘CSA’ and ‘farm share’ so that customers be-lieve they are directly supporting local farms with their purchases when they might not be. After a peak in 2010, she confirms, memberships in CSAs have been going down across the board. She wishes that middlemen setting up buying and distribution hubs would stop using the term ‘CSA’ altogether. But the proponents of new, more flexible hubs and aggregation systems, whatever they are called, are convinced they are helping the local farms. Ms. Ying argues that the more food options her customers have, the more likely they are to remain in the hub, which in turn buys from and sustains 15 local farms. Traditional CSAs have a high turnover rate, she feels, and many people simply find the system too inflexible for their needs. Besides, some feel, consumers have only so much time to spend vetting their food system. Taking the time to tease out whether buying granola made in Brooklyn qualifies as supporting local agriculture can test the patience of consumers. Now that local food has become big business, there is no limit to the possible competition. Target and Walmart, for instance, are trying to get a piece of it, and even Amazon is building infrastructure for home delivery of food. This new demand has been a boon for many farmers across the country, but the beneficiaries are especially large-scale farmers equipped to sell in bulk. Small, local farms are at a disadvantage in this market. In interviews with farmers, policy makers and entrepreneurs, all parties agree that for fragile local food systems to strengthen, consumers will somehow have to be offered more choice and control over what they eat than is possible with a traditional CSA.